Yes, I have to bathe the kids after, yes they actually swim In the sandbox, yes the younger one opens her diaper to put some sand inside ( I mean come on girl). Still sandbox has been a hit out and out. 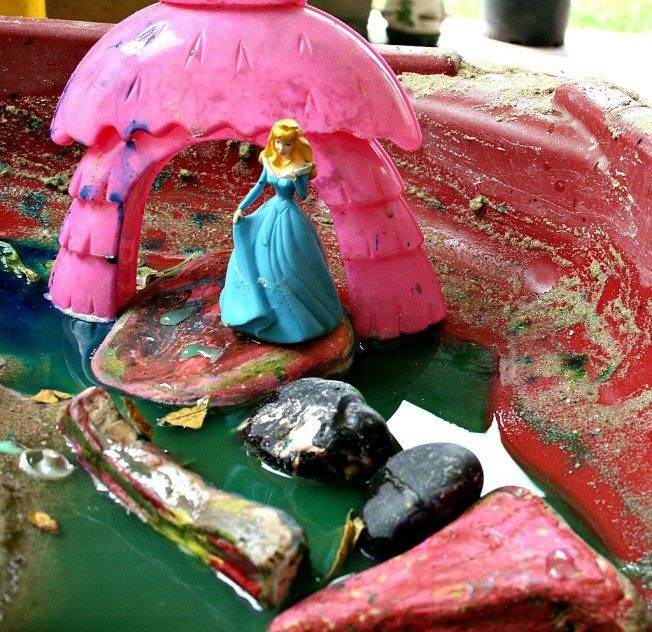 After a long hiatus for our sandbox ( it was our mud kitchen during the spring), this summer it has seen plenty of action. 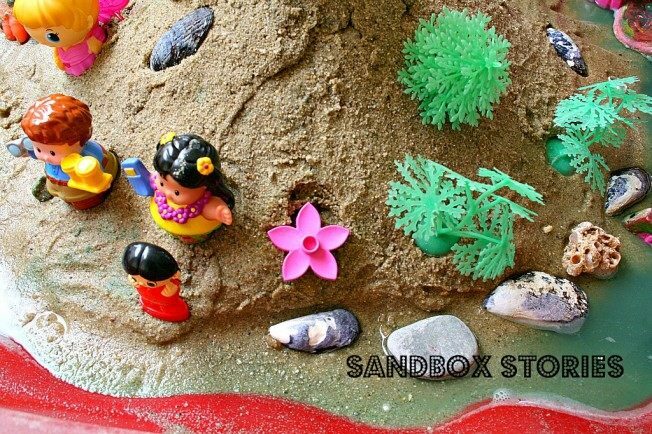 This post is my first installment of a new series “Sandbox Stories”. 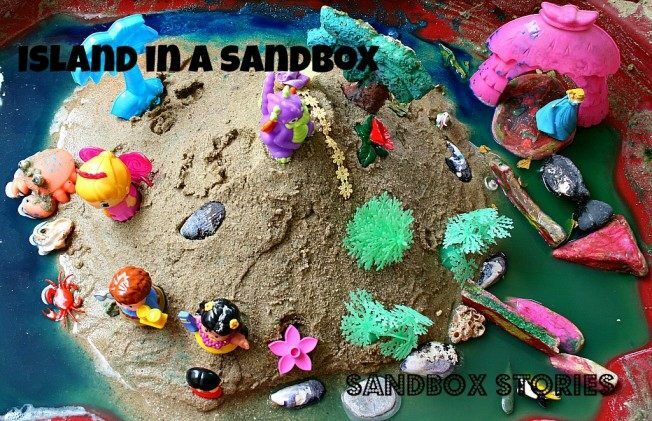 There are plenty stories and tons of learning happening around our sandbox that I really need to start blogging more about this activity I always take for granted. Yeah it is not as glamorous and colorful as model magic or designer cake play we have had in the past. But being a nature girl, Big A is plenty entertained by anything nature. Big A: I’m building a lake , a lake a lake. It actually turned out to be an island. Mom: Hey that’s actually an island. Big A : What is an island? Mom: It is land surrounded by water. 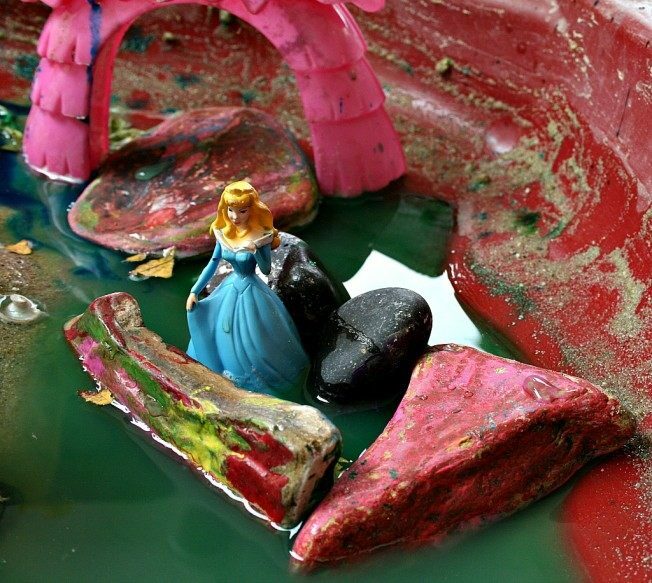 What followed really told me about her world – her very small world. Big A : What? Land surrounded by water? Oh My God! How will people go to the store? They have to swim? Not having the heart to magnify her world at a young age, I repeated. Mom: Well land can be a city. Our city could be surrounded by water on all sides but we can still go to the store by car. How will you explain island to a 3.7 year old? For her, her world is her home may be her street. When I say land surrounded by water, she visualizes her house being surrounded by water. With that in mind, her instant question makes sense. While I’m sure she DID NOT get the concept that an entire city or a landmass larger than a house could be surrounded by water, she knows the simple definition – surrounded by water = island. Before building, I showed her a picture of an island. I would really like for her to actually participate in the set-up- especially for small world play. For me, set-up is part 1 of the play. It fosters critical thinking and visualization . The actual play which fosters so much creativity, imagination skills and language skills is part 2. With a picture, we collected our things. 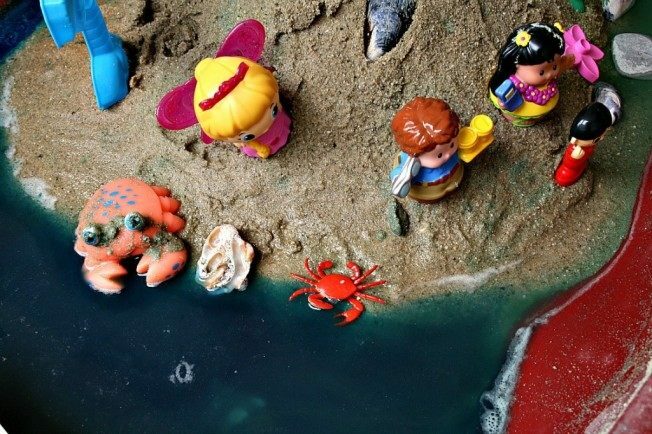 Little people and little toys – whatever catches your kids’ fancy. 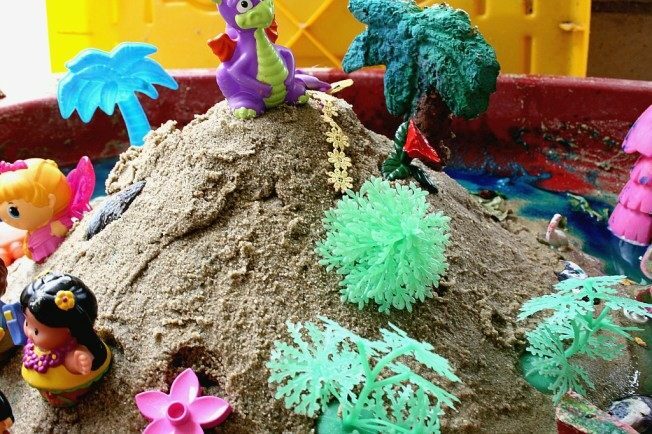 We started with basically gathering all the sand to the center of the sandbox. Baby A – the destroyer, did the opposite. After carefully watching her older sis collect the sand to the center of the box, she still did the opposite. We managed to get the sand in the middle to create the landmass. Here goes the first piece of vegetation. We also used our paper mache trees. Here is our princess in the water. Since she is a brave princess she swims to a rock all by herself. Our hot rocks dam. We used our melted crayons rocks. Here is Big A’s island all built by her tiny hands. Not too fancy, but fiercely protected by a good natured fire-breathing dragon. If you have done this or you intend to try this, please give us feedback. We really appreciate it. For next time, a volcanic island would be awesome With some Baking soda + vinegar action. If you have pictures, post away or leave me a link in the comments. :O !! No words!! Simply superb! I love it when kids tell stories about their small worlds. 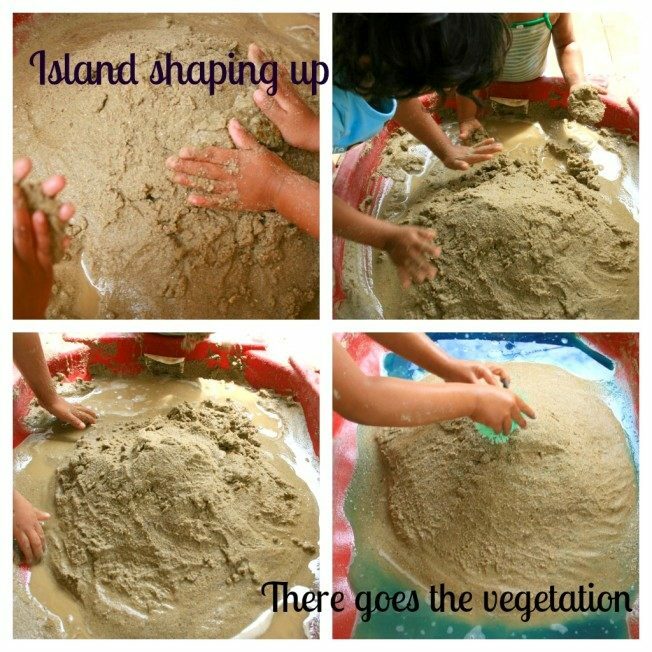 This was a great activity for introducing the concept of an island. 🙂 Thanks for sharing at the Sunday Showcase. What a fun activity! 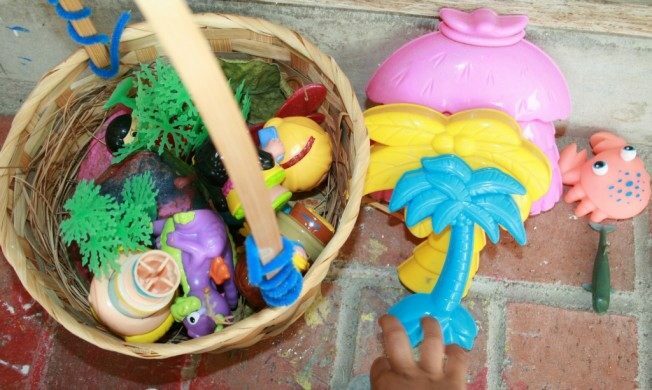 I am featuring this on my weekly Kid’s Co-op roundup on my blog tomorrow! What a great idea!! I’m sure it was a lot of fun and learning at the same time for big and little A. I love all your posts and have read each one of them. Great content..the dialogues between mom, big A and little A helps the reader visualize the play scene. Excellent job! You are one Super mom for doing all this for your daughters! Rock On Turkey Mom! Island has become a big deal here. Thank you for hosting a fun link-up. All your crafts are extraordinary!